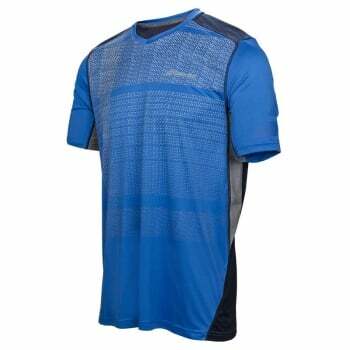 A V-neck T-shirt with ventilated breathable back for playing performance tennis. A modern tennis T-shirt which is breathable and comfortable with a mix of materials. Its ventilated back yoke and 37.5 technology enable the Performance V-Neck to quickly wick awaymoisture, enhancing your playing comfort. Its 360º Motion design provides ease of movement and a feeling of lightness while playing. Mesh yokes and underarm ventilated fabric. V-neck, fitted shape. Do you own the Babolat Mens Performance V Neck T-Shirt Nautical Blue?